After the success of Norse Road 1, a further opportunity was identified along Norse Road and land at Norse Road 2 was optioned. The planning history of this site, again shows the lengths to which the Company will go to in order to obtain a satisfactory planning permission and thereby maximise land value. A brief history is as follows - the site was originally promoted at a Section 78 Appeal by a full team of consultants and was unfortunately unsuccessful purely on the grounds of prematurity to the Local Plan. It was then vigorously pursued at the Local Plan Inquiry and had a positive recommendation by the Local Plan Inspector. 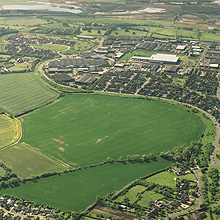 To improve the planning prospects of this greenfield site, it was decided to pursue a further Section 78 Appeal which was approved by the Secretary of State. In doing so, the time taken to reach a positive outcome was considerably shortened.